as Profiled in "Talk of the Town"
The Coldwater Steampunk Festival's Suzy Burtenshaw has won THE PRESTIGIOUS CHARLIE KELLY TOURISM AWARD! Surprised and humbled by this award, Suzy gave an immediate tip-of-the-hat to the incredible army of creative spirits that have contributed to the Festival over the years. "We couldn't have done it without YOU. Thank you to our program partners, sponsors, volunteers, hardworking Festival Board Members, and spectacular Steampunks for sharing in our success. AND Thank you to Bayshore Broadcasting and BruceGreySimcoe (RTO7) for this INCREDIBLE HONOUR. It's full steam ahead!" 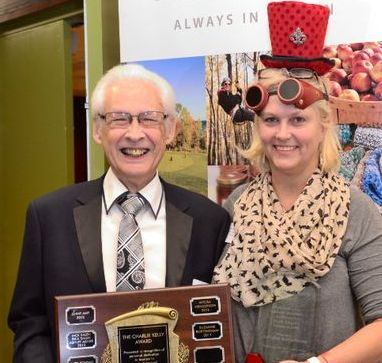 Suzanne Burtenshaw of the Coldwater Steampunk Festival is the winner of this year’s Charlie Kelly Award, presented at the BruceGreySimcoe Regional Tourism UnConference at Blue Mountain Resort on November 14th. The award honours the memory of Charlie Kelly, who championed the idea of four-season tourism for Owen Sound. It embodies his spirit and looks to recognize the person who has helped to grow the tourism industry the most over the last year, through initiative, innovation or by acting as a role model. The Charlie Kelly award committee received 16 nominations this year for 12 individuals. Past winners include Mylisa Hendersen, Don Braden, Jeff Carver, Patti Kendall, Jack and Rick Salen, Ashley Miller, Bryan Plumstead, Chris Hughes and Jenny Amy. Thanks to the support of Bayshore Broadcasting, this award has grown from recognizing tourism champions in Grey and Bruce counties to honouring those in Bruce, Grey and Simcoe counties. RTO7 provides strategic and collaborative leadership to build, sustain and grow tourism in the region comprised of Bruce, Grey and Simcoe Counties (BruceGreySimcoe). We are one of 13 RTOs – independent, not-for-profit corporations – to which the Ontario government provides approximately $40 million in annual funding to lead tourism planning, marketing and development in their respective regions. 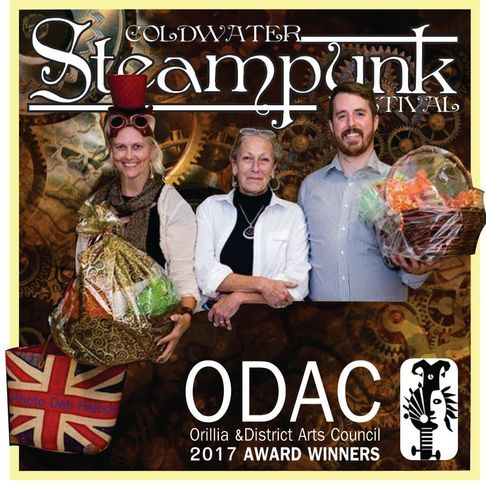 The Coldwater Steampunk Festival is where imagination and creativity collide with alternative realities - and it is now home of the Orillia District Arts Council’s 2017 Community Arts Award! Many thanks go to our colourful Steampunks, jubilant volunteers, generous community partners, visionary founders, and the whirl-wind of energy that is Suzy Burtenshaw. Every year is a different experience, unleashing the artist in all of us, and it IS a wonderful ride. To learn more see www.steampunkfestivalcoldwater.com . #ColdSteam 2017 sends compliments to fellow awards winner, Tyler Knight (http://knightvision.ca/). His outstanding artistic contributions to Orillia’s cultural life earned him ODAC’s Arts Achievement Award. A tip of the hat also go out to this year’s nominees: Beth McKean (www.bethmckean.com) is a vibrant singer/songwriter/clothing designer inspiring change in Orillia; and Ruth Germain collaborates with more than 200 local artists each year to produce “Somniatis”, a wearable art fashion show and silent auction supporting the Museum of Art and History (www.facebook.com/pg/somniatis2016orillia). WOW. We’re so lucky to be in this awesome company! Pictured above: Suzy Burtenshaw and ODAC President, Marg Gurr, and Tyler Knight.